Description: This hack can only play World 1~7 and 10. And this hack is World 7 Demo. 9-2 : Modified wrong palette sprite. 10-7 : Modified movement pipe cutoff. 2-1, 2-S2 : Modified movement pipe cutoff. 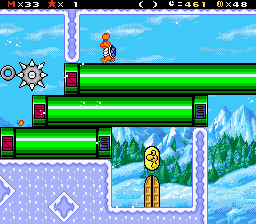 2-2 : After obtaining Yoshi Coin, graphics bug fixes. 3-3 : ON / OFF Door graphic errors corrected. 3-7 : The second castle inside replace the door Layer 2 to Layer 1. 10-1 : Fixed an issue that did not see the message. Red Switch Palace : Fixed Dolphins did not follow Mario. 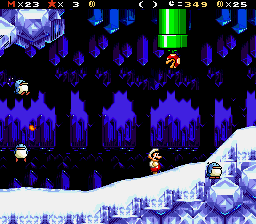 Green Switch Palace and Others : Modified poisonus mushroom block crashes the game if Mario touches it from the sieds(coners). 3-5 : Added a keyhole room. 10-5 : After obtaining Yoshi Coin, graphics bug fixes. World 7 + Expert World Demo release. Yellow Switch Palace : Fixed that the exits of the pipe in the second map were wrong. 2-Fort : Fixed problem moving to level 0. 2-2 : New version was created. 5-1 : Added Secert Exits. 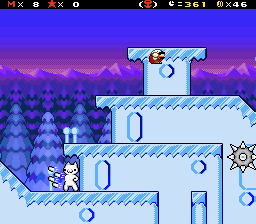 7-2 : Fixed a bug where one pipe moved to the original SMW 1ED level. Please report bugs I did not notice. - World 5 - Level "Sky Airship" - You can jump on top of the level at the beginning. Looks like cheese. The same happens after first CP. But if you come to the end you are completely softlocked. Since the height invites to jump up there you should add something to prevent people from doing this. - I liked the enemy placement very much. 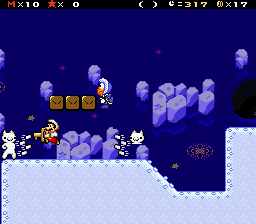 Chain jumps are very mean It's challanging and earns the "very hard" difficulty level. - I like the way, the level transissions are designed. A level ends in the same way the next level begins. That's a cool idea. 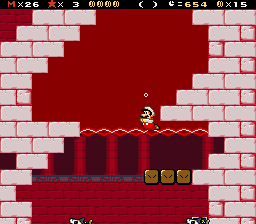 - World 5 - Level "Flying Sky Zone" has a dead end after the pit you can fall down. The auto scroller ends, there is a key but no key hole. - World 5 has these violet pillars everywhere. You cannot tell if the pillar is in the background or is a bloicking foreground object. This should be changed. - Enemy sprites are different for the same enemies (Thwombs for example). Since the behave in the same way they should look the same to get the design more consistant. I'm gonna ad more things after playing through all available levels. So far, it's really nice! Keep it up. I liked very much this hack! quando sairá a versão completa? I played this last night, I enjoyed the level designs and the graphics are nice. My only issue is that it isn't friendly for console players, the lack of save points quickly demoralized me from wanted to play it further. 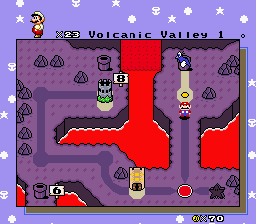 I would suggest adding more save points for the final version or a replayable save point stage somewhere in world 1 so that console players can at least attempt to grind through levels without having to lose too much progress. 3/5 but I would easily rate it higher if I could save my game more often. WHEN WILL THE COMPLETED VERSION? I love this game! I can see their as a lot of effort put into this. Love youe work man! Can'twait to see more hacks from you. Okay, it has no issues now. It's a good hack more or less; I honestly hate the difficulty, it sometimes feels like there's no way to avoid the enormous amount of hazards on screen. This goes from the very beginning of the hack till the end. Thus, I'm changing difficulty mark here to "Very Hard" since I feel it'd suit best. If any player here disagrees, let me know it with a comment down here. - Wrong actlike of tiles in here. I can go inside this FG. - Sprite tile limit issues, which in this level are a lot for some reason. - I can access the next level of this map even if I didn't complete the former one. - Swimming a tiny bit on this water when upside down is possible. I'd replace the lava actlike with a custom instakill block. - I think I addressed this already, but this kind of death trick is silly and unfair, especially since the level is insane already. Better to get testers. It's not hard to post in your thread to get beta testers!